Reedley was just a teenager of 15 years when Jesse Jansen raised the curtain on opening night in 1903 at the brand new Opera House. But in just those few short years leading up to this gala event, so much had happened that it warrants a look further back into Reedley’s history. Sadly, Reedley was going through a transition from wheat land to vineyards. There were many factors leading up to this transformation. Alkaline began surfacing in the soil and that killed out the wheat seed. The homesteaders in America’s heartland began to be more productive, vying for the wheat dollar. Prices became so competitive that the bottom fell out the wheat market; it didn’t even pay enough to cover the cost of harvest. Farmers could store their wheat, hoping for the price to go up, but they also ran the risk of mildew, and rodent infestation while the wheat sat in the warehouse, making the grain useless. The situation drove many wheat farmers into bankruptcy including T.L. Reed. Reed, however, had investments in petroleum and real estate, and this allowed him to plant his former wheat fields with grape vines. 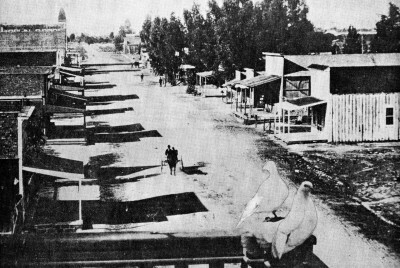 The town of Traver, who once set a record for the amount of wheat delivered, warehoused and shipped – a record that still stands today – suffered greatly from the wheat depression and was fast becoming a ghost town. Buildings that could be moved were being relocated to Reedley or Dinuba. This was fairly easy to do because house movers didn’t have to cross the Kings River. The buildings that were moved were made of wood. 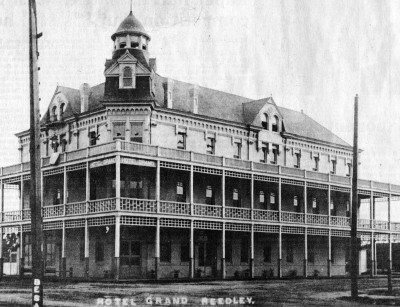 In fact, most of Reedley’s buildings were wood at the turn of the century. Lumber was plentiful in the Sierras, fairly cheap and buildings could be erected quickly. The Peloian building on 13th Street next to the Santa Fe railroad tracks was built of granite quarried from Smith Mountain. Reedley Grammar School, constructed in 1892 on 12th and K streets, was made of brick. The Hotel Grand on the corner of 12th and G streets was also brick. If you could stand on the third story veranda of the Hotel Grand (along with the pigeons), and look north, up G Street, you would see that there were no brick buildings in the 1100 block of G Street. In the 1000 block, Moomaw’s jewelry store and the Gosliner Building leased by Bollin and Mathews are the only two brick buildings. The last brick building in town is the Granger warehouse currently owned by McNare Grain Company, on 10th Street between the Santa Fe and Southern Pacific tracks. The streets were dirt and the walkways that connected downtown were made of wood. Business owners found Reedley profitable and the townspeople considered Reedley a nice place to live. But, in the early hours of August, 1902, events were going to change Reedley forever. A little after midnight on or about August 11, 1902, fire was spotted leaping out of the roof of the Gosliner building. Gunshots rang out, warning sleepers of the danger and to summon the bucket brigade. Once before, in 1901, the bucket brigade had to be summoned to fight a fire at the Alta Machine Shop. The foundry had caught on fire, but fortunately the fire was contained to that building. This time, however, the fire was much worse. The entire west side of G Street between 10th and 11th were in flames and it wasn’t long before the fire spread to the buildings on the east side of the street. By the end of the fire, both sides of the 1000 block of G Street lay in ruins. Only the residence across the alley on the east side of G Street remained standing. The townsfolk were successful in saving the rest of the town. As Reedley smoldered, with the pungent odor of smoke still in the air, the northbound passenger train brought in the sightseers from Dinuba. The entire sky had been lit up by flames during the night. In the face of the disaster, there were glimpses of humor, as reported in the Reedley Exponent following the fire. A Mrs. Anderson and the 13-year-old Smith boy moved her new piano downstairs to the safety of the street. This same piano had taken five strong men to get it up the stairs a month earlier. Sam Houston, one of the bucket brigade volunteers, decided to cool down Lucy Mathews at the water pump. Even after getting doused with water, Mrs. Mathews didn’t miss a beat, pumping water faster and continuing to demand that the post office be saved. It was said of Sam Houston after the fire, that with the exception of drenching Mrs. Mathews, he was a hard worker and an excellent bucket brigade volunteer. Fifteen businesses were destroyed and five lodges lost all their furniture and paraphernalia. The combined loss in structures and contents totaled close to $100,000. One of the few businesses to have insurance was the Gosliner Building which was valued at $10,000 and received $6000 from their insurance company. Ironically, if this brick building would have had steel fire shutters installed, it would have sustained little damage. Looking east toward G Street from the bell tower of the Reedley Grammar School. The Gosliner Building is on the far left. There was even a conspiracy theory going around town! It was rumored that a disgruntled store owner, who was going to lose his property insurance at the end of the year, torched the town. In actuality, the fire started somewhere in the livery stable next door to the Gosliner Building, but the cause was never determined. Remember Jesse Jansen from the beginning of this story? Well prior to the fire, he was an employee of McNare Grain Company and had been transferred to Reedley. At some point while working for McNare, Jansen became the owner of the Reedley Water Works. After the wheat industry died, the water works business wouldn’t sustain him full-time. Jansen would need some other source of employment if he was to remain in Reedley. After the fire, the townspeople immediately began to rebuild. Jansen saw the opportunity to reinvent himself as Mr. Entertainment. He built the Jansen Opera House and The First State Bank of Reedley – Reedley’s first bank – on the site formerly owned by the Gosliner brothers. A big thanks to fellow second generation historian, Ken Zech, for sharing his research on the 1902 fire. Stay tuned for the Opera House, Part II next month, where we will explore the fun, frolic, music and plays from opening night in 1903 to the present day. I’ve been enjoying your writings on the history of Reedley since I discovered Kings River life several years ago. Sharing them with others from the RHS Class of ’55. very and interesting! I learned a lot. Looking forward to the next article.